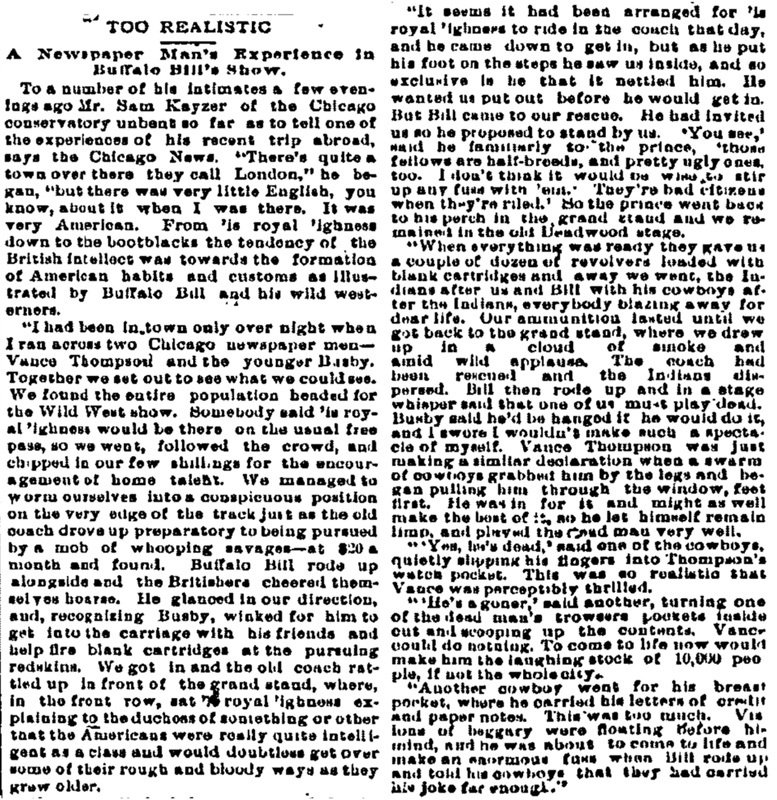 A Newspaper Man's Experience in Buffalo Bill's Show. To a number of his intimates a few evenings ago Mr. Sam Kayzer of the Chicago conservatory  unbent so far as to tell one of the experiences of his recent trip abroad, says the Chicago News. "There's quite a town over there they call London," he began, "but there was very little English, you know, about it when I was there. It was very American. 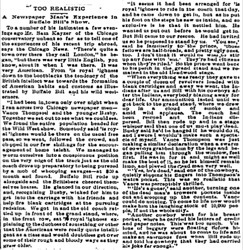 From 'is royal 'ighness down to the bootblacks the tendency of the British intellect was towards the formation of American habits and customs as illustrated by Buffalo Bill and his wild westerners. "I had been in town only over night when I ran across two Chicago newspaper men—Vance Thompson  and the younger Busby. Together we set out to see what we could see. We found the entire population headed for the Wild West show. Somebody said 'is royal 'ighness would be there on the usual free pass, so we went, followed the crowd, and chipped in our few shillings for the encouragement of home talent. We managed to worm ourselves into a conspicuous position on the very edge of the track just as the old coach drove up preparatory to being pursued by a mob of whooping savages—at $20 a month and found. Buffalo Bill rode up alongside and the Britishers cheered themselves hoarse. He glanced in our direction, and, recognizing Busby, winked for him to get into the carriage with his friends and help fire blank cartridges at the pursuing redskins. We got in and the old coach rattled up in front of the grand stand, where, in the front row, sat 'is royal 'ighness explaining to the duchess of something or other that the Americans were really quite intelligent as a class and would doubtless get over some of their rough and bloody ways as they grew older. "It seems it had been arranged for 'is royal 'ighness to ride in the coach that day, and he came down to get in, but as he put his foot on the steps he saw us inside, and so exclusive is he that it nettled him. He wanted us put out before he would get in. But Bill came to our rescue. He had invited us so he proposed to stand by us. 'You see,' said he familiarly to the prince, 'those fellows are half-breeds, and pretty ugly ones, too. I don't think it would be wise to stir up any fuss with 'em. ' They're bad citizens when they're riled.' So the prince went back to his perch in the grand stand and we remained in the old Deadwood stage. "When everything was ready they gave us a couple of dozen of revolvers loaded with blank cartridges and away we went, the Indians after us and Bill with his cowboys after the Indians, everybody blazing away for dear life. Our ammunition lasted until we got back to the grand stand, where we drew up in a cloud of smoke and amid wild applause. The coach had been rescued and the Indians dispersed. Bill then rode up and in a stage whisper said that one of us must play dead. Busby said he'd be hanged if he would do it, and I swore I wouldn't make such a spectacle of myself. Vance Thompson was just making a similar declaration when a swarm of cowboys grabbed him by the legs and began pulling him through the window, feet first. He was in for it and might as well make the best of it, so he let himself remain limp, and played the dead man very well. "'Yes, he's dead,' said one of the cowboys, quietly slipping his fingers into Thompson's watch pocket. This was so realistic that Vance was perceptibly thrilled. "'He's a goner,' said another, turning one of the dead man's trowsers pockets inside out and scooping up the contents. Vance could do nothing. To come to life now would make him the laughing stock of 10,000 people, if not the whole city. "Another cowboy went for his breast pocket, where he carried his letters of credit and paper notes. This was too much. Visions of beggary were floating before his mind, and he was about to come to life and make an enormous fuss when Bill rode up and told his cowboys that they had carried his joke far enough."